The Ardu2 circuit is has come along way since the start of this project. I now have a fully operational circuit mounted in a housing, and connected to a slightly modified but mostly standard electric guitar ! And don't forget to read the doc! The ArduStomp is GO! Check out the Video Fly-by! from the amazing 30C3 event! Check it out! 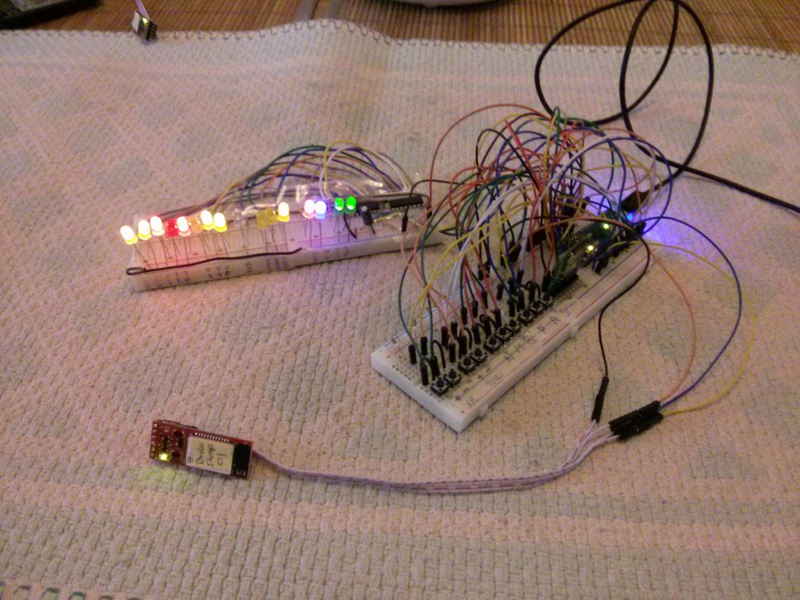 Check out the write-up on HackADay. The ArduStomp: a StompBox control (strawman), check out the Video! 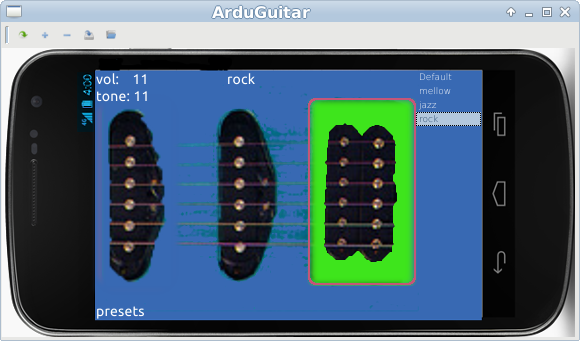 The ArduGuitar available for Android! Look ma: no pots to turn, no buttons to push! After breaking an ACL in a tiny ski accident last winter, and depriving myself of the best ski season in the Alps in 15 years, I had nothing much to do but work on my ArduGuitar project which some may remember consisted of replacing the antique electromechanical controls of an electric guitar by a remote control on an Android phone connected by bluetooth to the guitar. Although my electronics knowledge dates back to my junior year of high school in 1974, knowing three of the greatest software designers in the world, GIYF.com, the hackerspace community, GNU and open source were enough to make this a huge success! 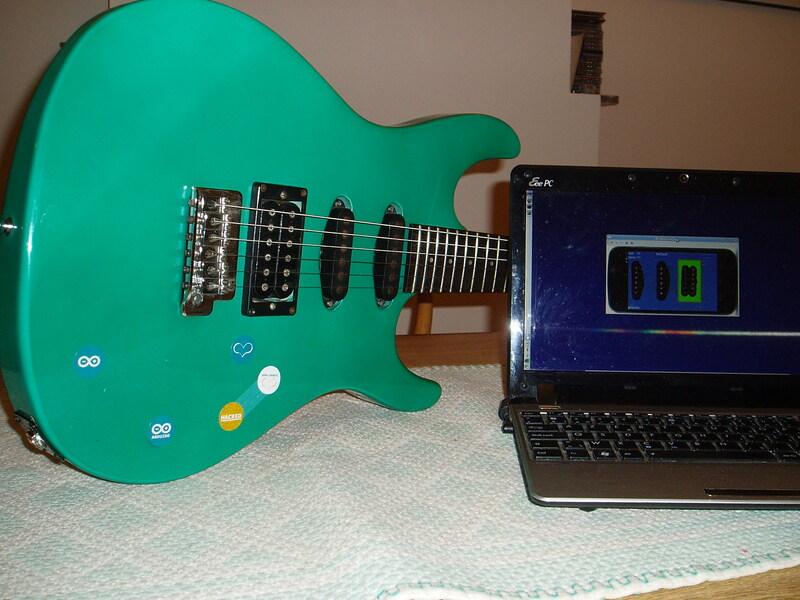 Check out a few pictures at the ArduGuitar Home Page , or all the gory details on my project notes. The code is available in my github repo. 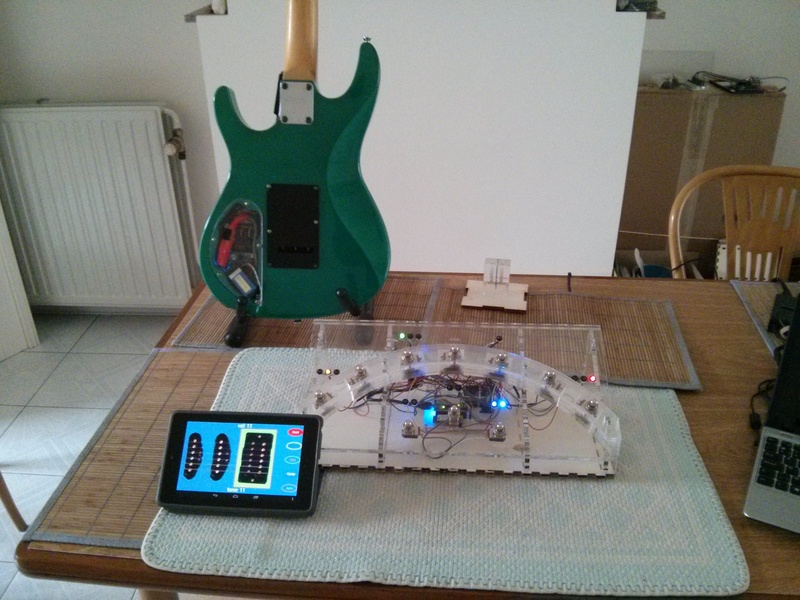 First, I analyzed the circuitry of an old Ibanez RG140 guitar which dated back to 1980. Don't worry, that's not old for electric guitars, in fact people pay more to get even older junk - as if any technology was better in the 1950s than it is today? What kind of person would believe that? So, I looked inside this old guitar and saw 2 switches, 2 potentiometers and a capacitor. All poorly soldered together in Asia a long time ago. I should mention that my RC model building has taught me how to solder properly. So only a few components, how hard could that be to "modernize"? Well, according to my music industry engineer friends, it was both impossible and stupid. That cooled me down about a year ago. Then, being someone who never gives up (which can be both good and bad), I continued thinking about it and came up with a sub-optimal idea for a circuit that I thought would be ok, if not equivalent to the original. But even that was more than my ancient electronics knowledge would allow me, so I started seeking help in the hackerspace community to which I had been introduced by Mitch Altman of "TV-B-Gone" and Noisebridge fame - I met him at the Brussels TEDx. The hackers had lots of ideas, and one in particular made all the difference. The real issue was how to use a digital circuit to control an analog signal. Well, there is an easy way: use light! A LED shining on a Light-Dependent-Resistor appeared on the horizon. Putting two of these together could be used to make a digitally controlled analog pot. On my "smart" (or more appropriately "emerging intelligence") Google Nexus 4 phone (that I had to buy in France, because Google won't sell them in Belgium, or even let you look at the webpage from a Belgian IP-address), I wrote an App that has preset configs, plus offers all the possible settings, and even more than on the original guitar. The presets can be updated and saved to the phone's memory. The phone communicates via bluetooth with the guitar and can be several meters from the guitar (I've tested it up to 5 meters away). But since I need the control to play the guitar, I choose to keep the phone above the guitar held in place with velcro. Later, I ran the app on my Nexus 7 tablet as well! It was a huge learning experience, but during the voyage, I got a bunch of ideas for a next version, which will be even better! 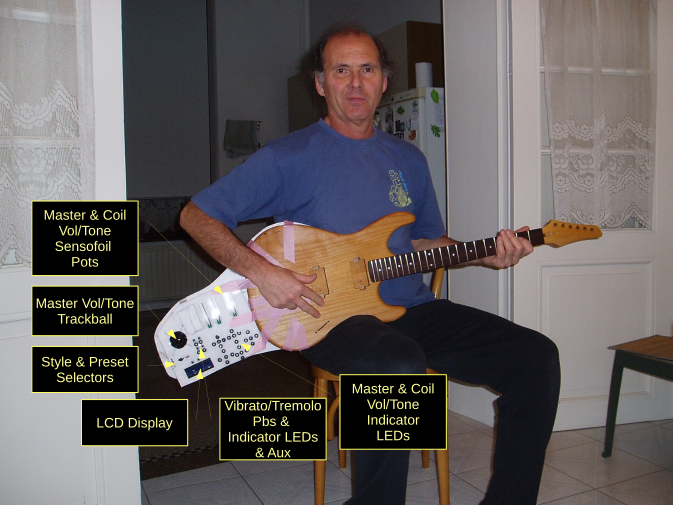 But what exactly is the ArduGuitar?" 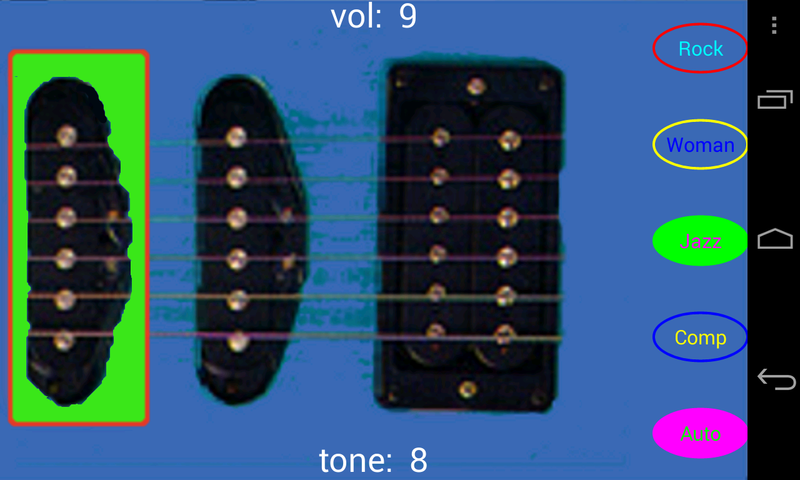 In some cases the individual coils in the pickups may be activated or not. That old fashioned way works fine, but is limited in the space taken by each switch or knob and the difficulty in wiring it all up. In the 21st century, we've gone digital, which means that electro-mechanical parts are no longer used. But on the electric guitar nothing was changing. Most if not all guitar techs or engineers are convinced that the old way is the only way and therefore the best way since it's the only way. To do that I had to find digitally controllable replacements for potentiometers and switches, and a way to command them. Optically controlled "opto-isolators" (called Vactrols) were the solution I found. Controlling them was relatively easy using an Arduino. But how to communicate with the Arduino? Not by a wire... Bluetooth? And what cheap and popular devices have bluetooth and a great interactive interface? 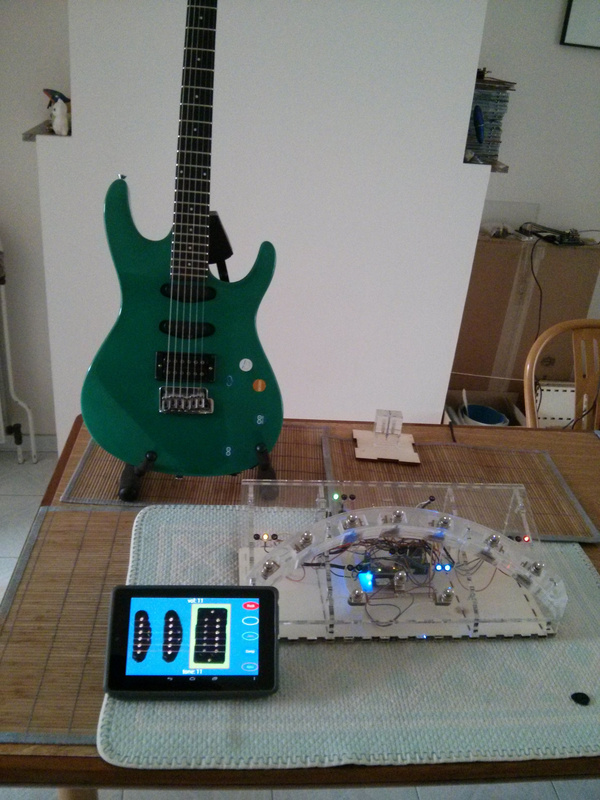 So I wrote an Android app that communicates with the guitar by bluetooth and does all the things I said it should: select pickups and coils, adjust volume and tone, save and recall configurations that the player has defined, etc. Then, listening to suggestions from various musicians, I implemented on-board effects by means of automated switching between presets! For example, to create a tremolo effect, simply create a preset with a high volume, and one with a lower volume, then schedule the switching between the two presets at the rythme desired for the tremolo. With a little playing around, much more complex effects can easily be implemented on the guitar itself!